Excerpts from "The Vyborny Book"
These excerpts contain three footnotes which are designated by asterisks *) in the text. The footnotes are Dr.Josef(*1864)'s comments regarding the spelling of the family surname, the "Cernik's legend" and some persecutions during the 18th century. As "the branch of Pucher" [which is a part of Frydrich's "Kresetice" line] the descendants of those members of the Vejborny family are identified *) who, having confessed the helvetian evangelic [Protestant] faith after "the Patent of Toleration" was issued [in 1781], have stuck at the inherited traditions of their ancestors. They were the three brothers [8Jan(*1747), 8Jiri(*1748), 8Josef(*1750)] who have settled as "the familiants" [new-settlers] and have confessed the new [Protestant] faith. 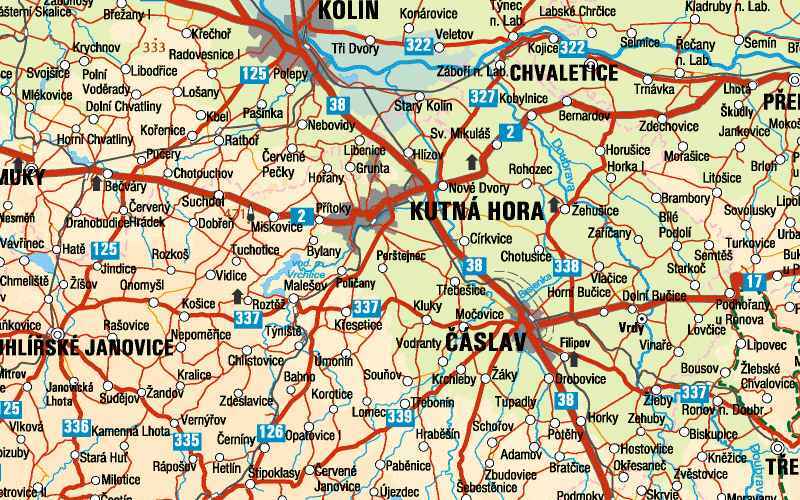 Such a way the new "familiant" villages originated: Puker, Pritoka, Pabenice, Korutice, Opatovice [where the evangelical church, parish and school existed in the 19th century - see "Opatovice II" in the SE corner of the map], Cerniny, Zisov, Malejovice. -...as a field-master he used to take religious books (of "the Secret Czech Brothers" or something like this) with him in the fields. Vybornys both of Puker and of Mancice told me that. Once while on a pastureland being absorbed into reading he almost did not notice a Jesuit approaching him. So he threw the book as if it were a stone thrown after the herd in the field and drove the sheep away. After the Jesuit has searched him thoroughly..
Vacslav Vejborny Senior the former field-master living in Krupa village later died there aged 80 - his great-grandson was aged 9 that time *) . ... other people were still subject to manorial labor - though not as severe around Kresetice as at some other localities*). Both Jiri and Jan took advantage of the possibility to become "familiants" and had made their younger brother Josef to take-over one familiant's piece of land too. ... the church [evangelic] in Mocovice was consecrated in September 1785. The whole family thus entered a new period of its life. A tie of the new faith (which was beloved by them with enthusiasm) attached all its members to each other. Earlier, they had attended secret services carried out somewhere in the region of Zaky. But now they could declare their faith in public and stand facing freely their fellow-citizens. The magistrate of the village of St. Catharina declared in the presence of others that Satan and the False-Prophet have appeared in a human body in surrounding forests at night around the recent Easter Holidays. This Satan has called many farmers from various demesnes to the fire there. Then he prepared the bread and the cup, all of them took the Eucharist and his preaching lasted for one and half-hours. This news frightened my spirit very much as the same day I committed one woman to prison and fellows who were suspected to had informed citizens of St. Catharina about arrival of this False-Prophet. On questioning she declared later two other women have come in that forest with her. Those women admitted then six others from surrounding villages and three farmers [were present there]. So I imprisoned three women yet and one farmer who succeeded in escaping. Therefore, my very reverend, it is necessary to intervene in time for the spark in ashes to be canceled and so that a destructive fire would be quashed before it begins. I beg advice from you and to transmit this my letter to our most serene Cardinal. As I am not able to gain any certification of transgressions in faith from many of these [imprisoned individuals], I will force them using violence to do so. Written in Cirkvice, the parish office on July 31, 1658. P. Basilius Wierzbicki of the Carmelite Order [S.P.M.] priest of Cirkvice."